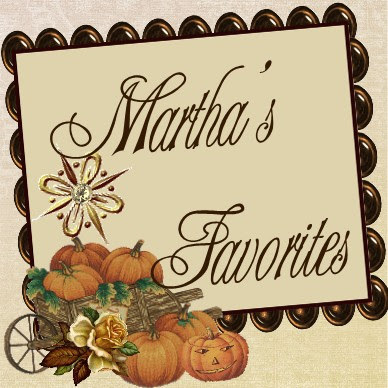 Martha's Favorites: THE DIVA AND THE TEA CUPS! Just had to share this great report, because you have know of my monthly struggles with her. I will start with this Month's tea cups. 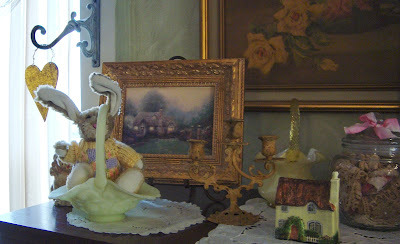 The change has started for my home and some green and some "Easter" items has begun to show up their cute faces. I have started with a few St. Patrick's Day cups. My son does have a little Irish in him, from his Dad's side. My first cup is Royal Dover from England. 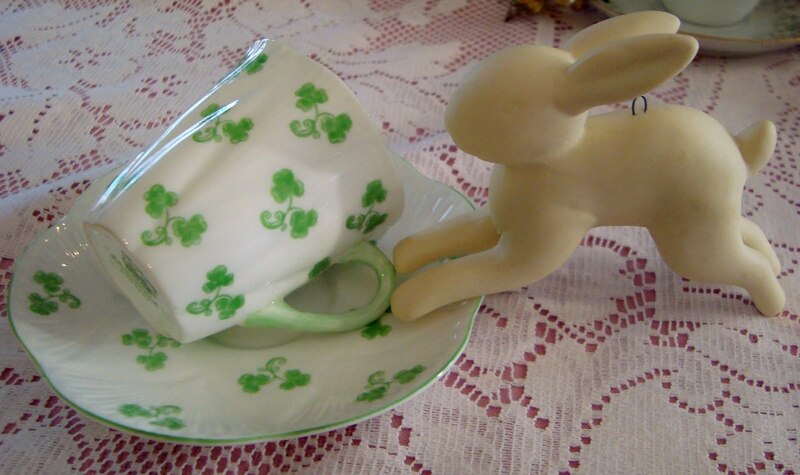 The cup is covered in clovers. Very pretty. The next cup is a Shelley. The name is "A Dainty Shamrock". A beautiful cup that only Shelley could do. You can see a star in the saucer. The cup is a muted color green, just stunning. Before I go on the my next cup, I want to share my Belleek Tea Pot. I own the entire set, however, the tea pot I think is the best part of it. One of my favorite tea pots that I own. It is amazing! My next cup is this amazing Earl of Coventry "Blind Earl" Pattern. It is part of the Connoisseur Collection. Please look at this cup carefully. Everything is raised in a 3 dimensional look. I feels like you can just pick up the stem of leaves with your hand. This is one of my favorite cups. The sad thing is I don't even remember where or when I purchased it. 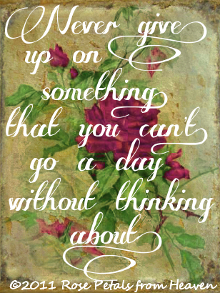 I am usually so much better at that. This old grey mare, she ain't what she use to be! 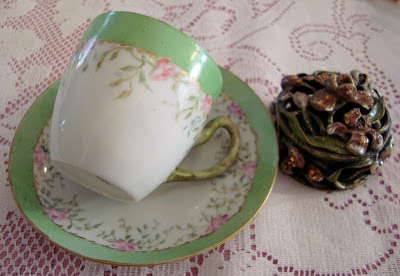 The last cup I am sharing this month is a hand painted Bavaria, demitasse cup. Please look at the handle it painted in a stem color. Just a stunning dainty design. I love it. As you may have heard our Terri is on an Art Vacation. She will not be sharing a cup this week. Beautiful baby and teacups! I have a three month old grand daughter, she is my heart! Your teacups are lovely as usual and I love the Shelley! So glad you and your precious little grandbaby spent some alone time together and all went well. She's a darling! Thanks for sharing. How wonderful you and your grandbaby came to terms...loving ones! What a joy! 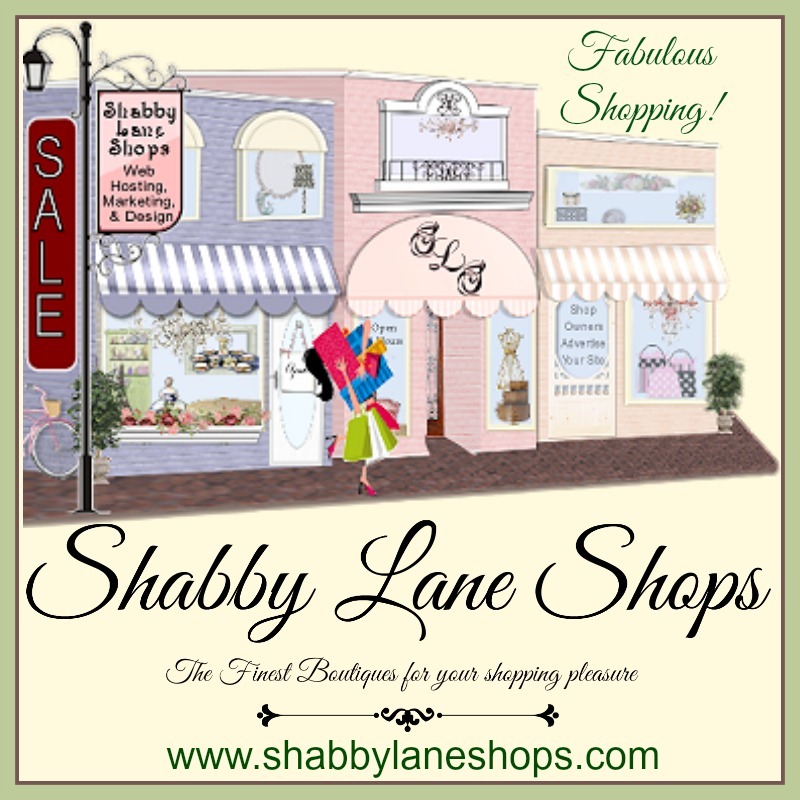 Love your Shelley (of course)and Belleek is perfect this time of year, isn't it? 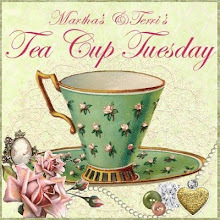 Thanks for your sweet comments (blush, blush) and thanks for linking with Tuesday Cuppa Tea! LOVE your shamrock and green-themed china. It is so festive and sweet! You are right, your Beleek teapot is fabulous!!!! That little pink sweetheart is sure a cutie pie, too! 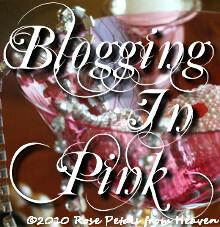 Thank you for hosting a wonderful linky party! Martha incrível olhos de Bebe! incrível sua coleção de xícaras e joias tons verde! 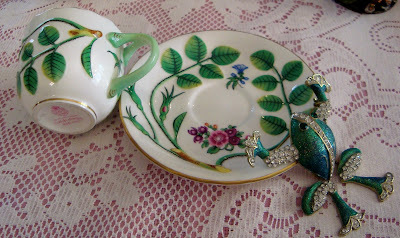 Your tea cups are so beautiful! Love your collection. It is impossible to pick a favorite out of these. You do realize that, right? She is so dang kissable! Congrats Gma! I am sure your heart swelled with joy at this change of events. I actually felt like my child from birth to about 4 months was NOT fond of ME - she cried NONSTOP! AAAGGGGHHH!! 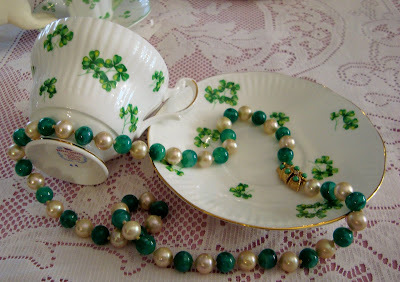 I am so fond of your st patty's day teacups and green flare! Thanks for hosting. Adorable bay! 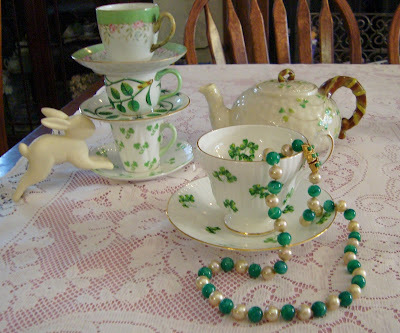 Your teacups are gorgeous, I love them all, specially the one with the clover and pretty teapogt. Thnk you for hosting. 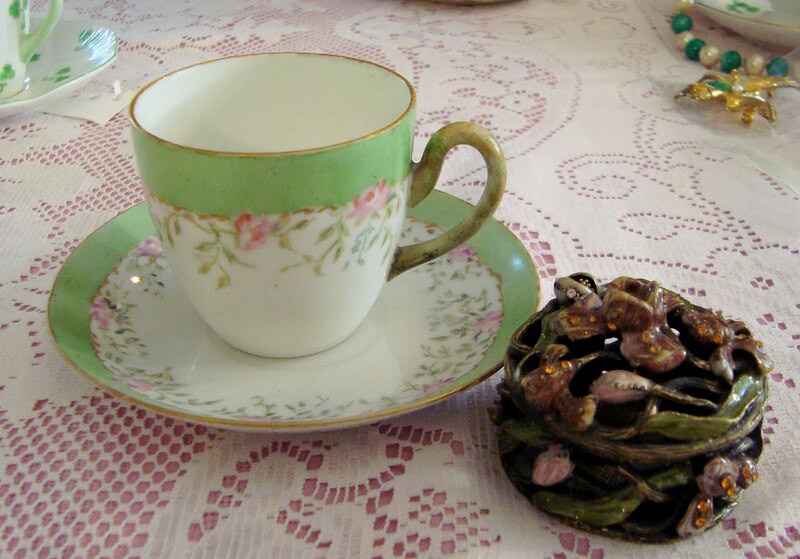 Loving the Shelley clover cup and saucer...thinking this looks like Belleek to me and then seeing your beautiful Beleek teapot.....beautiful. Thanks for sharing. So many beautiful green tea cups!! You never cease to amaze me and never disappoint!! Beautiful teacups for St. Patrick's Day! So lovely. Thank you for hosting. Good morning, Martha. I am so happy that you made a break-through with your granddaughter Sophia. It is VERY important that our grandchildren see no flaws in their grandmothers. They bring so much joy and I know your heart must be reeling. You so deserve ALL those wonderful hugs and kisses! You have such SWEET WARE today, lovely lady! 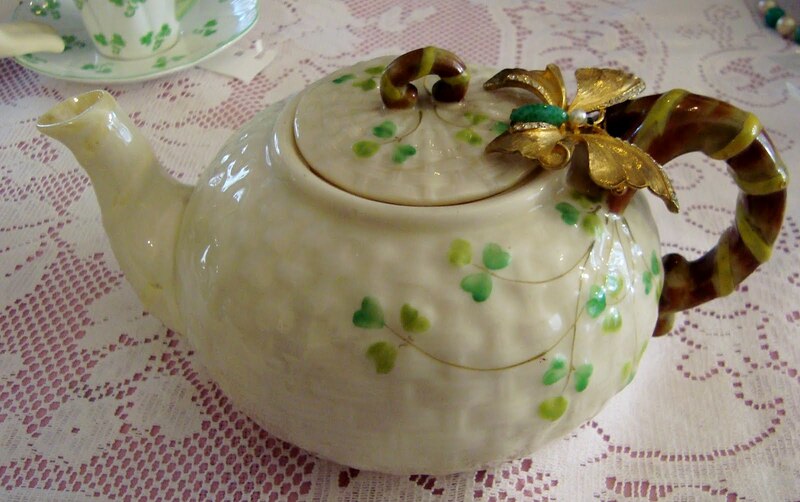 I dearly love the Belleek Tea Pot. 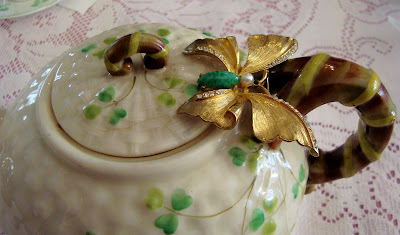 I am not sure if that big butterfly on the pot actually goes on the pot or if it is one of your most beautiful brooches. VERY NICE either way! I know Terri must be having a wonderful time about now. How wonderful that she gets to take an ART VACATION! I miss her today, but will catch her on the next round. Bless you for making the break through with the cute little diva! she's so adorable! Bless her and all of your loved ones! 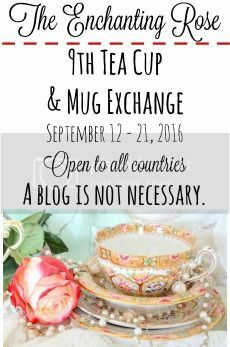 I always envious of your beautiful collection of teacups, I'm so in love with your clover teacup and the belleek teapot is just gorgeous! 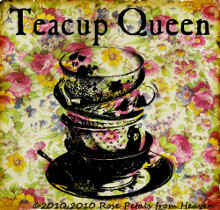 but all of your teacups are just lovely! 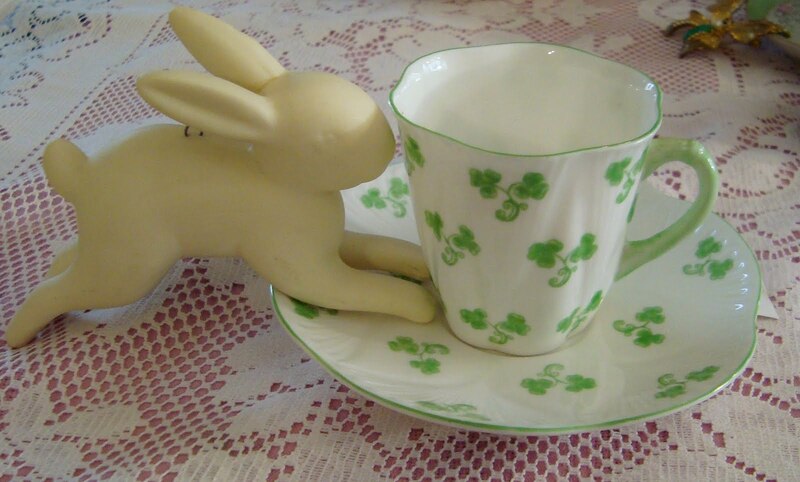 thank you for sharing this and hosting another tea time tuesday! Hi Martha! I enjoyed reading your update about your little Diva. 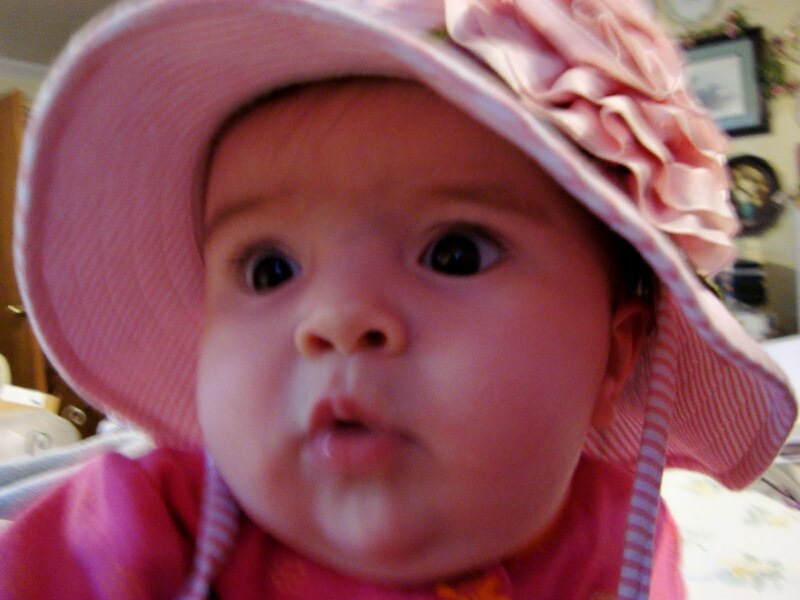 I'm so glad you cleared the air:) What a sweetie she is...love the bonnet! 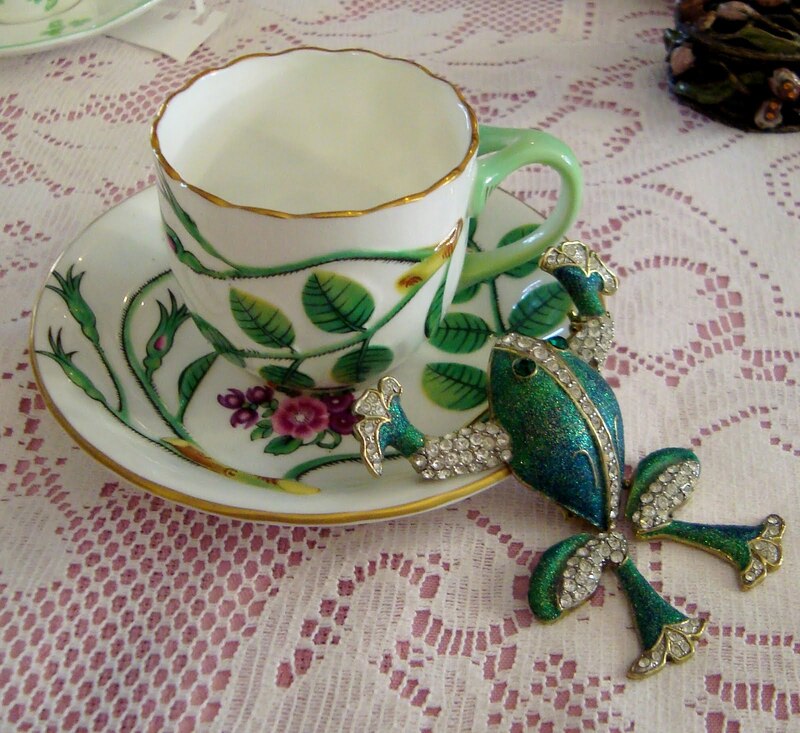 Your green teacup collection is lovely...you have so many! I'm not sure which one I like the best, they are all pretty. 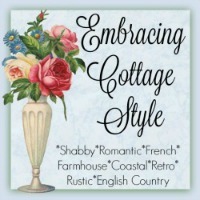 Your home is looking transformed into a lovely spring time oasis. 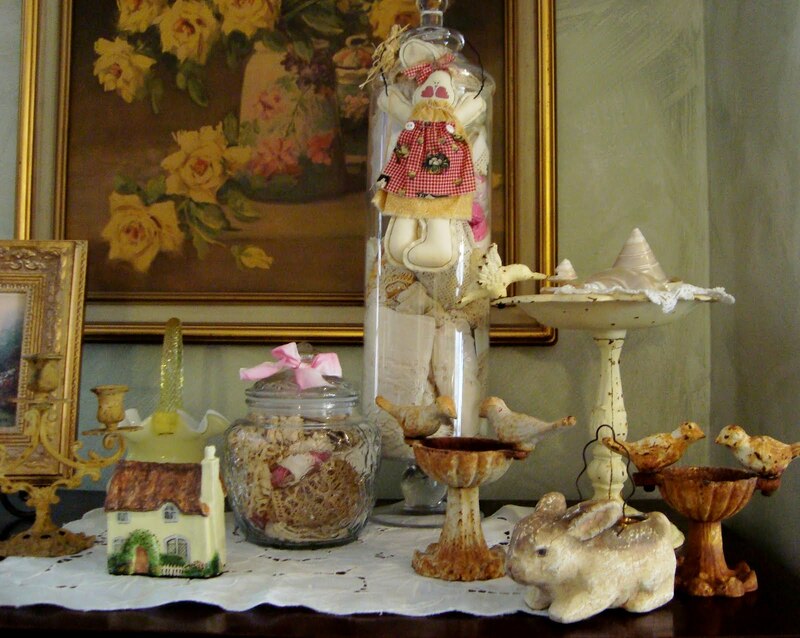 Your grandchildren must enjoy visiting you and seeing all the lovely decorations each holiday. just be a bit patient, little Sophia will love you then. You are such an good grandmother. Sophia just has to learn a lot now. Your cups are today so wonderfull. Each is very special and the Shamrocks are perfect for the upcoming St. Patricks day. 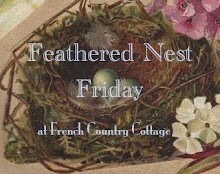 Thank you so much for sharing your treasures and for hosting this sweet event. HI Martha! Loving all your greens today! I've a shamrock cup to share later in the month, too! Thanks for the Davy Jones sounds - waxing nostalgic . . . 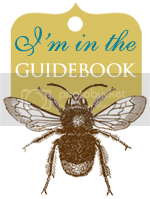 I'm celebrating my one year blogoversary so do stop by - posted your button in the story about linkups and other adventures this year! I am so lad you got some personal time with Sophia! 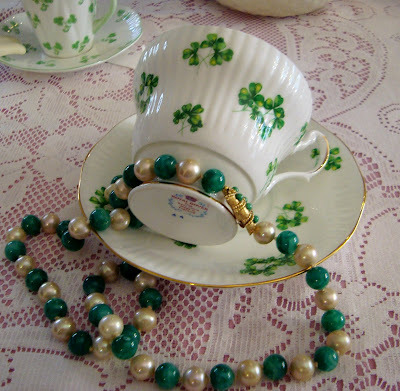 Your Irish style tea cups are lovely! Thank you for hosting! I enjoyed reading your post about your precious babe...she is adorable! All your teacups are so pretty. Thanks for hosting. 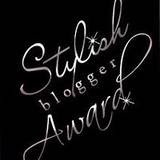 Such a lovely post, and blog! I'm a new follower...Love Sophia; so glad you've worked things out! I love your tea cups. So much green in time for St. Pat's Day! What a sweet post about your adorable diva! I loved that you made up and there you are! Wonderful babylove. Thanks for the Monkees! Such pretty tea cups, and that jeweled frog is cute! I was over joyed to see you had my Pink Bloosom Set displayed in among the others. Thank, you so much. Your a doll! My heart was jumping for JOY! Love your little Princess adorable and big boy. 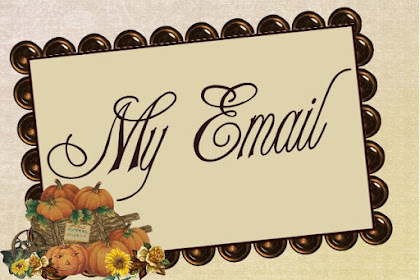 I have my show and tell with my bigger Grandchildren in my blog today. As big as they grow. They will always be Our Grandbabies. Right Martha.